Undine by Friedrich de la Motte Fouqué. Home » Undine by Friedrich de la Motte Fouqué. THE seas, the rivers and brooks contain the numberless tribes of Water-sprites. Those that dwell there below are noble and lovely to behold, far more so than mankind. Many a fisherman has had a passing glimpse of some fair water nymph, rising out of the sea with her song; he would then spread the report of her apparation, and these wonderful beings came to be called Undines. And you now see before you, my love, an Undine. 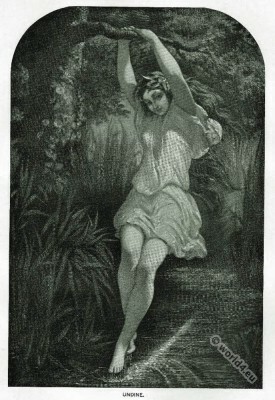 “Undine” by Friedrich de la Motte Fouqué. Muller, Artist. Friedrich Heinrich Karl Baron de la Motte Fouqué (pseudonyms Pellegrin and A.L.T. Frank; 1777-1843) came from a old aristocratic French Huguenot family. He spent his youth in castles and manor houses of Brandenburg. Especially in the years 1810-1820 he was one of the central figures of the literary life in Berlin and one of the first German romantic poets, considered as representative of the “romantic historicism”. The old sagas of the north and the stories of the French knights of the Middle Ages flowed with him together to a fantastic world. In May 1795 he met Elisabeth of Breitenbauch which became the prototype of the “Undine”. Undine, interspersed with fantastic elements, partly in fairytale written story, appeared in 1811 in his magazine The Seasons, A quarterly magazine for romantic seals, and as a book. Quote: Cried and bled there must after all be in this antechamber of the actual eternal life. It weeps and bleeds but is at its best when one is still young. This entry was posted in 19th Century, Fairy Tales, Genre, Germany, Romantic Era and tagged Character sketches, Romanticism fashion on 5/29/15 by world4.